An evocative new work by visionary filmmaker John Harrigan and F00lishPe0ple brings to life a story of awakening to a greater reality… and unlocking inner truth. It’s been a year since Eve died, and while her body was revived, her spirit is damaged. She feels like she’s lost herself and struggles to present a normal façade. Her life before death seems like another’s memory. Her husband, son, her acclaimed writing career… all vague somehow. Eve’s family gives her a beautiful journal, hoping it will help her creativity spark. She intended to record her recovery. As soon as she starts to write, however, the alien world at the edge of her dreams begins to pulse through and compels her to write the transmissions down. Soon, these visions consume her. Her life disintegrates. Is Eve losing her mind or wallowing in Truth, evolving to post-human? John is an award-winning filmmaker who has won acclaim for his previous films and theatrical productions. He continues his exploration of the numinous with Lightships. 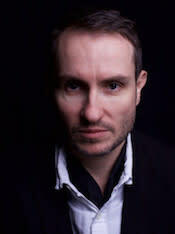 His first film, Strange Factories, was featured in Wired and Filmmaker Magazine and toured the oldest cinemas in the UK. Armageddon Gospels is due for release in 2019. A founder of F00lishPe0ple and one of the earliest pioneers of immersive theatre in the UK, his work has been commissioned by institutions and organisations such as the Institute of Contemporary Arts, British Film Institute, Royal College of Art and presented widely throughout the UK, the US and the Netherlands. As a healer and writer, Maryann serves as a clear and open conduit to the divine, a noted seer, mentor, teacher, interdimensional liaison, and wayshower. 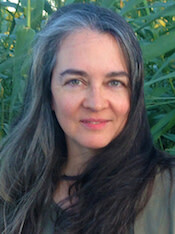 She’s embodied healing practices ancient and modern to bring focus on raising individual and planetary consciousness. After facing an abrupt shift in life circumstances, she began to chronicle her journey through awakening. This experience is fictionalized in the film Lightships, which sources largely from her book, Remembrance. Learn more at Nine’s Path (https://ninespath.com). RADA-trained actress Lois has international credits as a performer/devisor and producer. She owns and runs the production company Blue SiSTAR, and has produced immersive film and stage work in places as diverse as the Namibian desert, a royal palace, a church crypt, and Catherine deMedici’s wedding bed. Having recently toured the globe with her award-winning one-woman show Beerey, Lois reveals her raw authenticity in the lead role in Lightships. Originally from the Czech Republic, Tereza worked in classical theatre in Prague for almost 10 years before moving to London to explore more innovative performance methods and to challenge herself by performing in English. She joined F00lishPe0ple as a core member of the creative team in February 2006 and has since extended her repertoire to the edges of the inner human experience. She infuses a dynamic depth of presence to Lightships. David had been performing in Bristol, UK-area theatre productions, taking on lead roles as disparate as Jesus and Prospero, before moving to London 15 years ago. Following his studies at East 15 Acting School, he picked up a taste for experimental theatre and has been working with F00lishPe0ple since 2007. He is an actor who thrives on the strange and has a passion for portraying complex dystopian characters and fictions, making his role in Lightships engaging to the extreme. John founded the immersive theatre group F00lishPe0ple in 1989. Their unique “Theatre of Manifestation”, a form of ritual theatre, combines mythology, shamanism, drama therapy, strategic forecasting and open source collaboration. He brings intensity and spiritual force to a truly transformative leading role in Lightships, appearing both behind and in front of the camera. A graduate of the Italia Conti Academy of Theatre Arts, Lucy joined the core creative group of F00lishPe0ple in February 2006. Since then, she has produced and performed in all of their projects. Lucy co-founded the publishing imprint Weaponized in 2010 and has edited all of their released book titles. Her devotion to the arts of dance and drama lend her appearance in Lightships an intense, elegant strength within a powerful storyline. From his roots in Sierra Leone, Usifu (“The Cowfoot Prince”) is renowned as a storyteller and educator, a motivator and architect for social change and cultural awakening. He has cultivated arts education for more than 20 years and worked extensively on BBC radio. With generations eager to learn from him, through performance, documentary, festivals and his unmistakable presence, he paves the way for future storytellers. We’re delighted to have his inimitable style in Lightships. Mark (BAFTA Crew) has worked professionally for the past two decades, with work meriting international acclaim. His expertise in lighting (UCL Film Society/Christopher Nolan), and filmmaking (Metropolitan Film School, Ealing Studios) ensure a master’s touch behind the camera. Skilled with celluloid and computer-savvy in HD, Mark is making sure Lightships brings audiences an exceptional experience. Creative sound engineer Paolo has worked in many motion picture projects and holds degrees in music production, artist development, and creative music technology. Among his award-winning productions is a nomination for Best Sound Design in the Southampton International Film Festival. His five major music albums include two award-winners by Latin guitarist Thiago Colombo. We’re thrilled to have him on the crew of Lightships.